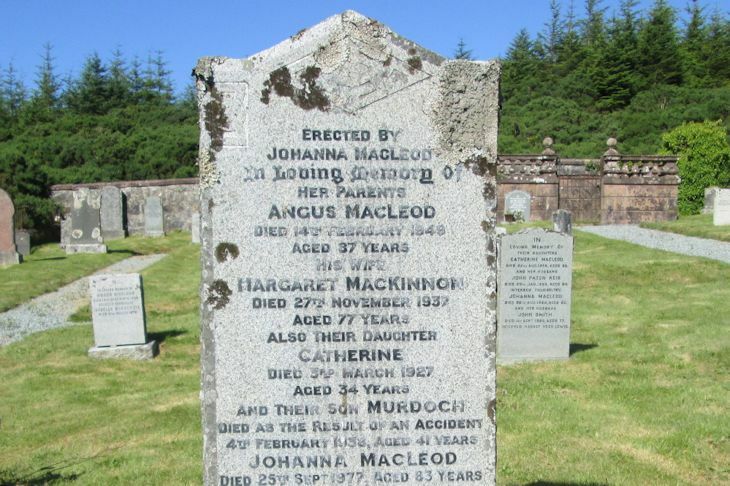 Skye Gravestones | Angus & Margaret (MacKinnon) MacLeod & family. Angus & Margaret (MacKinnon) MacLeod & family. Erected by/JOHANNA MacLEOD/in loving memory of/her parents/ANGUS MacLEOD/died 14th February 19149/aged 37 years/his wife/MARGARET MacKINNON/died 27th November 1937/aged 77 years/also their daughter/CATHERINE/died 3rd March 1927/aged 34 years/and their son MURDOCH/died as the result of an accident/4th February 1938, aged 41 years/JOHANNA MacLEOD/died 25th Sept. 1977, aged 83 years/["recent"]. Picture Added on 30 July 2014.